This product was added to our database on Thursday 11 April 2019. This book tells the story of the first helicopter in the world designed from the outset to be deployed at sea, in Destroyers and Frigates. It is primarily based on the words of those who operated it. Designed from the outset to cope with the restricted space of a warship both for stowage and flight operations it proved an immediate success. Its original role was to act as a weapon carrier to launch torpedoes and depth charges on submarine contacts out of range of the parent ship's weapons range. Soon, it also took on a second primary role of air to surface attack using wire guided missiles. The flexibility of the machine was such that it was able to conduct a plethora of secondary roles from visual search to collecting the all-important ship's mail. 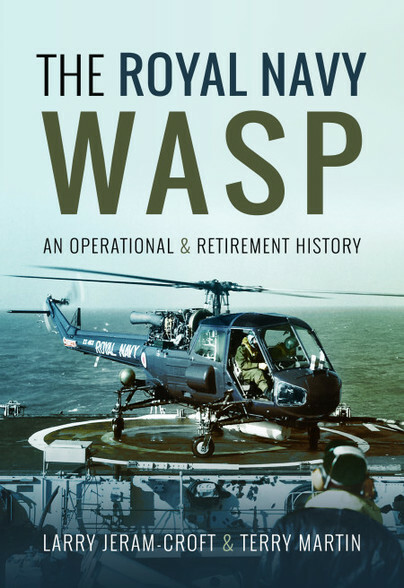 Wherever the Royal Navy was deployed on operations a Wasp was there. The book has accounts of operations around the world particularly during the Cold War of the Seventies and the Falklands War where amongst other things it had the honour of being the first RN platform ever, to fire a guided missile at a surface target. However the story doesn't end there. Although the aircraft went out of service in the Royal Navy in 1988, it continued to operate with other navies around the world. To this day there are still several airworthy examples flying. The second part of the book gives accounts of these machines and brings the story of the Wasp completely up to date.